Last weekend brought me to a couple of events around town that either revolved around food or had food there so I figured I’d throw a quick recap up for everyone. Friday night was the Marty’s Meats one year anniversary party at Richmond’s Tavern on Richmond Street just off of Main Street. To celebrate the Marty’s crew smoked a 180 lb pig that had to be cut in half just to move it around. 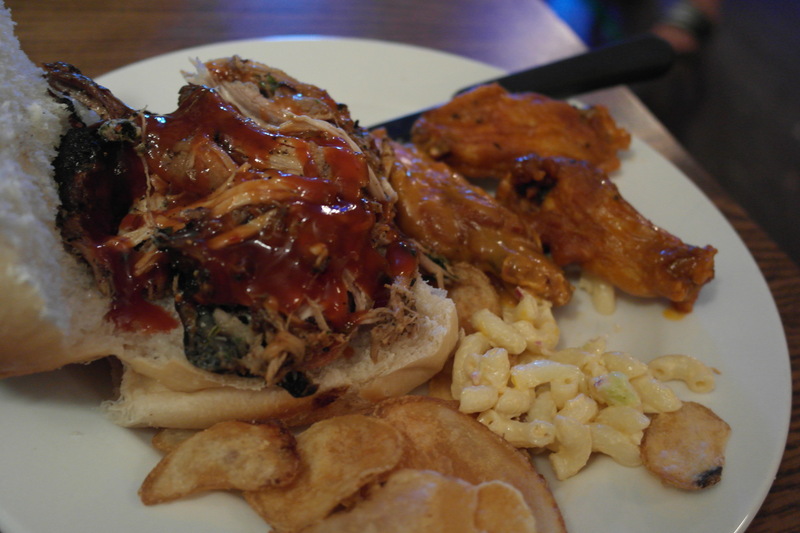 The spread at the event consisted of pulled pork from the smoked pig that was seasoned with Marty’s seasoned salt and served on crusty rolls with their BBQ sauce, Richmond’s wings with two different sauces, fresh chips and a few other accoutrements. The pulled pork had a lot of flavor (especially the bark pieces) and, despite the sweetness of the BBQ sauce, I really enjoyed it on the sandwich. I was impressed with the crispness and the Buffalo sauce from Richmond’s wings and I would count them among the upper echelon of wings I’ve had in Rochester. The chips were nicely crisp and my fiancée thought the mac salad was well seasoned. I universally hate all mac salads (and mayo based salads in general) so I’ll stick with her opinion on that front! A lot of family and friends were in attendance and it was nice to see everyone having a good time celebrating including Marty, Andre and Paul. Here’s to another year of Marty’s Meats! On Saturday, with my fiancée out of town at the Renaissance Faire (gotta have the olde timey on the end right? 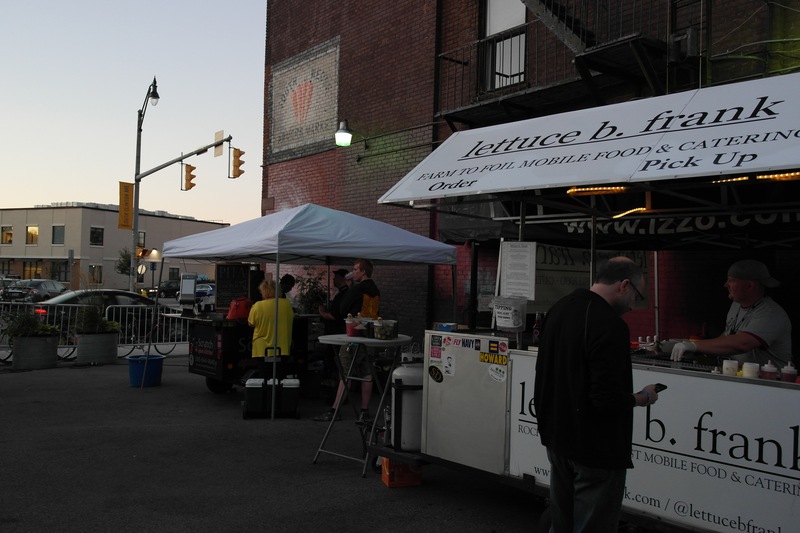 ), I spent a bit of my evening hanging out with Dave Potwin from Lettuce B Frank at Boulderfest in the South Wedge and checked out the scene. Two stages of music and a bunch of food vendors including Scratch Catering, Le Petit Poutine (closed by the time i got there), Dillicious, portable California Rollin’ and what appeared to be a grilled pizza from Napa. Not a bad food showing and my food from LBF was great as always. The parking situation was pretty awful as would be expected in that area but the music was decent from what I heard (some ska from the sounds of it) and it appeared to be a decent turnout. Not sure that I’d make a return trip next year but if you’re in the neighborhood I’d say it’s worth stopping in to grab some food and hear some music if you can’t hear it from your house already!